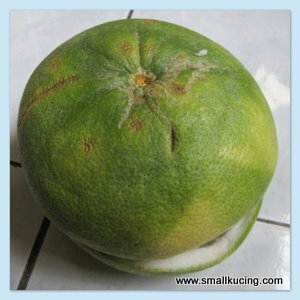 SMALL KUCING: How Do You Skin A Pomelo? As said in earlier, we bought many pomelo. Nah...Mamarazzi didn't buy big ones as it was not for praying. Bought pomelo for eating only. 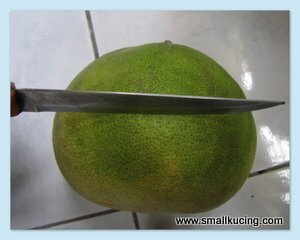 During Chinese New Year or special festival, pomelo is usually one of the offering on the altar. 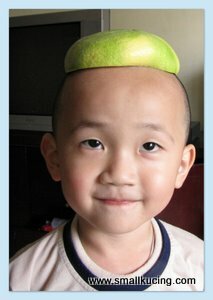 If not mistaken, the significant of that is the name of the pomelo itself. In Cantonese, it's called "Lok Yau" which sound similar to "abundance" in the same language. Well, how do you skin a pomelo? Some would skin it just like peeling an Orange. Just like what happen at the Lion Dance the other day. Mamarazzi skinned it differently as taught by her Papa last time. 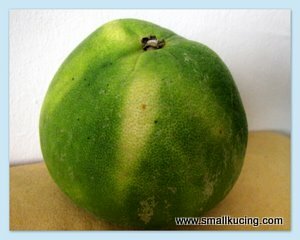 First, cut a thin line across the Pomelo like this. Then just pull it apart like this. 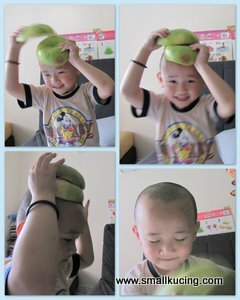 Coz if you can't finish eating the Pomelo, you can just "cap" it back. It will keep the Pomelo moist and cool. Can even put it in the fridge just like this. No need to waste clinging wrap. After finishing the fruit, I can even use it as a Cap. Actually there is a Chinese taboo against putting it on the head like this. If superstitious folks sees this sure will be scolded. What taboo is that? Well, the saying "wearing a green cap/hat" in Chinese means that a man is Cuckold. He has an unfaithful wife. That is not good. But Mamarazzi thinks main reason is that the "Cap" will make the hair dirty lah. hmm maybe it is good to put on the head where we can take away "bad things" Normally we use the pamelo leaves to clean ourself if there is a bad incident happen. Thanks for showing how to skin a pamelo in a different way. Usually mak isah skin just like the way suituapui said. He he that is a cute cap! Hey that's a good idea. My mom usually keep the extra pomelos in the fridge. 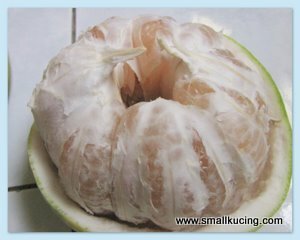 Thats something new I learned today on how to skin off a pomelo, normally I just koyak koyak everywhere. Oh tat's really interesting...thanks for sharing. Usually I keep it in the fridge oni. Hehehe, this is easy way to cut pamelo and look cute too to wear as hat.